There are some who argue that this Saturday night, I should root for Ohio State when they play USC. The argument goes that an Ohio State win makes the entire Big Ten look good, as the conference has taken a lot of flack due to its teams regularly losing to Pac-10 and SEC opponents (see: the last two Rose Bowls, OSU's tanking of the last two NC games). So the Buckeyes beating the Trojans makes the Big Ten look stronger. Thus, even though I am a Michigan fan and thus am obligated to hate all things OSU, I should put aside the rivalry for a few hours for the sake of the conference. Here's the thing. As a UM fan, I have not had a good decade. The Wolverines have only beaten the Buckeyes once, in 2003. Since moving back to Ohio, I have never enjoyed a UM win over OSU. And I've heard about it. A lot. It's been quite a while since the John Cooper era, and Ohio State fans have forgotten what that sort of misery feels like. In fact, aside from choking the past two Januarys and that lone UM win in 2003, they've had little to feel miserable about. While those NC games brought them back down to earth a little, a USC win during the regular season that keeps them out of that game to begin with would be even better. An Ohio State win would look good for the conference...but it'd still be an Ohio State win. And I'm sorry...we just can't have that. ...I'll be rooting for this goof's team. It'll be especially needed after possibly the ugliest UM-Notre Dame game ever. 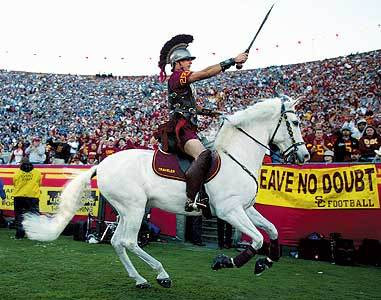 Go Trojans. But really, Go Blue.